Himalayan Pink Salt & Rainbow Peppercorns Mini Grinder Set...freshly mined, naturally pink & rich in complex nutrients Himalayan salt & a colorful melange of savory, piquant Peppercorns. 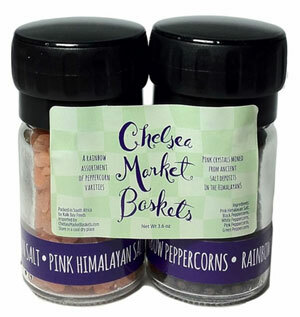 Himalayan Pink Salt & Rainbow Peppercorns mini grinder sets are perfect for everyday, picnics, camping, or boating. Himalayan Pink Salt & Rainbow Peppercorns / Mini Grinder Set. Size: Himalayan Sea Salt 2.1 oz., Peppercorns 1.3oz. Ingredients: Himalayan Pink Salt, White Peppercorns, Black Peppercorns, Pink Peppercorns, Green Peppercorns.